Trainset VR is a term I’ve used to describe some of my favorite VR titles. By that, I’m referring to experiences that make you a giant, towering over miniature dioramas that are a delight to explore from your god-like perspective. Apps like Google Earth, Wayward Sky and Giant Cop all carry an undying sense of fascination as you lean down into their model worlds. When it comes to Rolling Line, though, trainset VR means exactly that; it’s a game all about building virtual railways with all of that novel charm still intact. Rolling Line is the latest effort from Gaugepunk Games, the indie studio behind Frontier VR, a love letter to the wilderness, and the cave-exploring Echo Grotto. On the surface it’s entirely different from those two apps, but tonally it’s strikingly similar, creating an inviting environment that lets players set their own pace and giving them plenty of reason to linger in its peaceful world for longer than you might expect. Simply put, Rolling Line lets you make the model railways you’ve always dreamed of. You find yourself in a series of rooms, each with a set of tables. Either you can load up pre-made environments and spend some time exploring more of Gaugepunk’s typically scenic landscapes, or you can dive into an expansive customization system to make your own sets. There’s no real objective or goal to reach; it’s as if you’d just bought a bottomless toybox to entertain yourself with. How much you get out of Rolling Line will depend very much on what you want to put into it, then. As an experience it’s an exercise in tranquility; at any time you can teleport into your model worlds at a proper scale to tour the rural streets and breathe in the shiny sights. Teleport into one of your trains and you can lean your head out the window to soak in the landscape. Gaugepunk’s own creations are a joy to wander around in, even if these fake worlds don’t boast the kind of interaction and discoverability that made its last two games such a joy. Graphically, yes, it’s simple when viewed at human scale, but its color palette and variety help to make up for that. But the game’s is best enjoyed by embracing the creation system. Imagine having all the resources you need to build the model railway of your dreams with just a few clicks of a controller. That’s what you’re getting here; draws dotted along each table contain all the tracks and objects you’ll need to decorate your landscape. Placing stuff is as simple as picking an item up and then holding the trigger, which produces a laser pointer you can use for precise movement. Within moments you’ll be able to build basic tracks and then you can grab a remote controller to guide your trains. There’s lots of objects to scatter around your world, though it would be nice to see a Google Blocks-style in-game model creator to really stretch out the possibilities. Perhaps inevitably, it doesn’t provide the same sense of authenticity and pride that likely come from spending years building a real set, but given you can store all this mess inside your VR headset it would no doubt serve as a good companion for any enthusiast. There are a few bumps in the road, though. The game’s control scheme, for starters, is a little too finicky. Your hands in Rolling Line are solid objects; they won’t pass through tables and they’ll knock trains and carriages around when they come into contact. You might think this is a welcome touch for immersion but in practice I found myself becoming frustrated when hands would get caught under draws or I accidentally pushed a train over. The gap between virtual and reality can make it hard to judge where to place your hands, and I often accidentally pushed vehicles along tracks when I was trying to select them. Tellingly, the game also supports non-VR play, and the interface seems to have been built with this in mind. I’d also like to see more models added to the game to provide more customization on the player’s part. What’s here does allow you to make a wide range of interesting landscapes, but why stop there? This is the sort of experience that lends itself perfectly to content packs and updates, so hopefully those are coming. 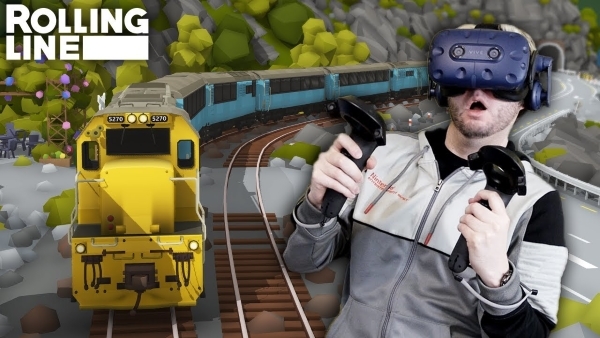 If you have any interest in building your own model railway, you’ll find Rolling Line is a typically delightful VR experience from Gaugepunk Games. While it’s not a true replacement for the actual hobby, it is a fitting companion to it, allowing you to build away to your heart’s content. Control issues aside, if you’ve ever dreamed of building your own world free from the limitations of this one, this is a great place to start. Rolling Line is available now on the HTC Vive and Oculus Rift for $13.99. Check out these official review guidelines to find out more about our process.